I recently launched Lounge Marketing to offer authors year-round book marketing advice and support. I had hoped that it would attract self-published/indie as well as traditionally published authors, which has proved to be the case. In fact, of my members 70% are traditionally published. Which is more than I had anticipated. The combination of the digital transformation of the book business and the rise of social media has meant that authors can now have one-to-one relationships with their readers. Previous to this, authors would have relied on passing meetings with readers at bookshop events and literary festivals. Authors now have the opportunity to continue relationships day-to-day through all of their channels. On many levels, this has been a godsend for publishers as they know that they can't have authentic relationships with readers & fans in the same way as authors can. So publishers have been busily pushing authors to get active on social media, build relationships with readers, bloggers, bookshops etc and for authors to play a crucial part in the marketing campaigns they have planned. All good. During this time, we have seen the rise of indie authors, many of whom not only engage with their readers, but also market and sell their books to them. They have become incredibly skilled in digital marketing. They have learned how to exploit every opportunity Amazon offers through KDP, AMS advertising platform, Facebook advertising and email marketing. They have focussed on marketing they can measure, refine and improve - smart granular marketing. They are also very vocal in sharing their knowledge. (Book marketing podcasts to check out). Traditionally published authors have seen what's possible and what can be replicated. They understand that their publishers will focus on their books for a limited time around publication day (6 weeks - 6 months) and that they need to pick up the ball. That said, I am still surprised that over half of traditionally published authors are spending their own money on marketing their books. 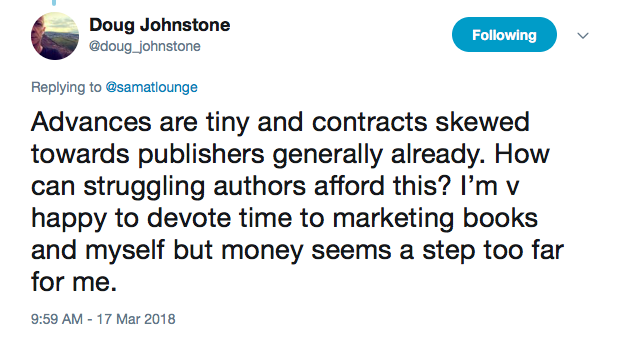 With another million-selling commercial fiction author saying they saw the money spent as a way to reward readers for their loyalty and this was separate to the marketing their publishers did. Authors are fully aware that marketing is the real battleground, so they are researching and targeting publishers known for great marketing. For authors who are active on social media it is fairly easy to see which imprints over-perform in marketing. Also, shock, horror authors talk to each other (often privately) about publishers. Many of the authors who responded to my question were happy with what their publishers offered in terms of marketing and understood the limitations. 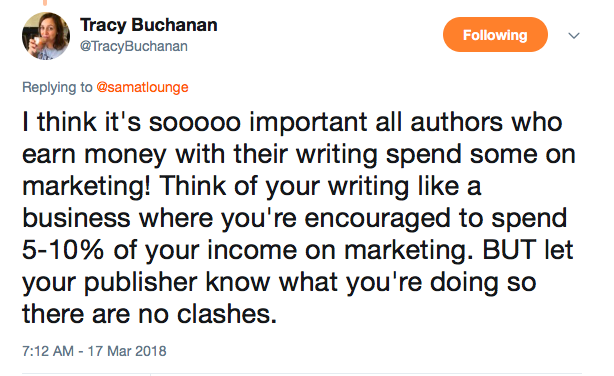 Of course there were a few horror stories from authors - publishers doing no marketing at all, sending authors a list of bloggers and telling them to contact them, telling authors to go away and learn Twitter and the like. It's hardly surprising that some authors will demand more and feel the need to take over the marketing and publishing of their books. Based on lots of conversations I've had with aspiring authors, the three main reasons for wanting a traditional book deal are; their books being available in bookshops, that publishers will market and sell their books and the kudos. And publishers certainly include marketing promises to acquire authors. I see more and more authors empowering themselves in all areas, engaging with readers, building audiences and managing and funding marketing activity and understanding the intricacies of publishing. Personally, I think this is great and very smart of authors to own as much as possible. Publishers must offer their authors transparency as to what works and what doesn't so together they can sell as many books as possible. Thank you to all of the authors who responded to my Twitter poll and gave me more information. If you found this post useful and would like more, then sign up to my free newsletter. If you have views on this, I'd love to hear them in the comments below.